Giving collectors even more of a say about the MLB news, events or milestones highlighted in the print-to-order program, 2018 Topps Now Moment of the Week Baseball lets fans vote for their top choice from the past week of action. That means a weekly vote to pick which card earns the right to take physical form. 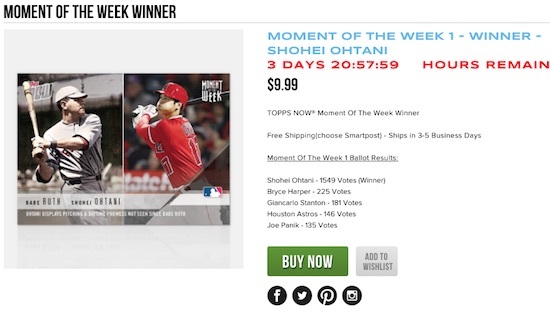 Although the main Topps Now Baseball set already uses feedback from social media to help decide the daily options, Topps Now Moment of the Week goes a step further and puts the decision squarely in the hands of collectors. Buy 2018 Now Moment of the Week cards on Topps' site. 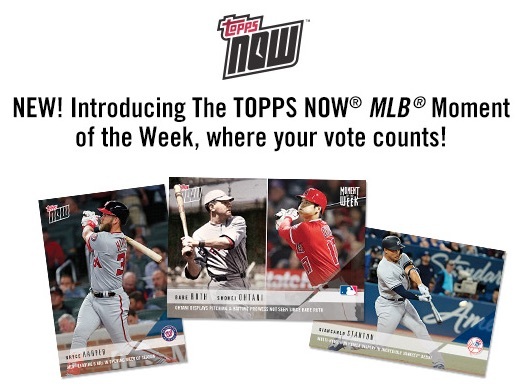 So, how does Topps Now Moment of the Week work and what is different from the regular Topps Now format? Fundamentally, there are a few differences, but the main idea is unlikely to be too confusing for those already familiar with Topps Now. Every Monday, the Moment of the Week Ballot is announced. That starts the 48-hour voting period where several different options are each priced at $7.99. Collectors can pick their preferred 2018 Topps Now Moment of the Week card at any point during that timeframe. However, every "vote" is actually a pending order to purchase. Only the card with the most votes is actually printed and those winning orders are processed once the voting period is over. Losing cards are not printed and any pending orders for these are canceled. Votes are finalized on Wednesday, with a complete ballot posted online. Those who select the winning card get a gold "Winner" logo version. From that point until the following Monday, the standard Moment of the Week card for the winner is available for purchase at $9.99. 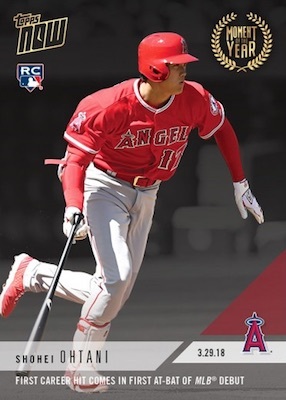 So, not only the does the cost go up to the normal Topps Now price, but the gold "Winner" variation is no longer an option, just the base card. For instance, Week 1 was between Shohei Ohtani (with Babe Ruth), Bryce Harper, Giancarlo Stanton, Joe Panik, and the Houston Astros. Ohtani/Ruth won easily. Therefore, that is the only card to be made from the group. Because losing card orders aren't processed, collectors can guarantee the winning option each week by voting for all cards on the ballot. Since only the winning card is printed, there is no risk of anything beyond buying the one Moment of the Week Baseball card. Similar to the Moment of the Week program, 2018 Topps Now Moment of the Year gives collectors the chance to vote on their favorite milestones, events and moments from the entire 2018 MLB season. Topps supplied 50 key choices from the year and collectors can register up to 20 of their picks. From those results, the top 10 selections are produced. The printed cards include the 2018 Topps Now Moment of the Year logo. 10 cards. 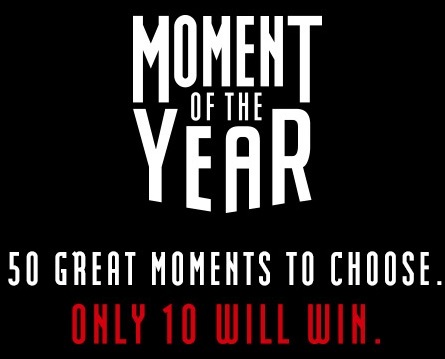 Buy 2018 Topps Now Moment of the Year cards. 30 cards. Print runs (PR) noted. Buy previous releases on eBay using the links below. MOW-16 Bryce Harper - Washington Nationals: 3rd 1st Overall Pick to Win Home Run Derby, 1st Since Ken Griffey Jr.
Bryce Harper 2018 Topps Now Moment of the Week - GOLD Winner - SP 587 BGS 10 ! 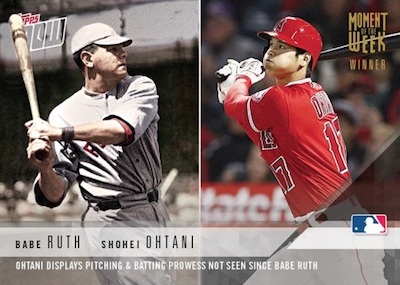 2018 Topps NOW Moment of the Week 1 Shohei Ohtani Babe Ruth MOW-1 Great card!!! No. It’s two different versions of the same card. You can buy one or the other or both. The Gold winner card is only available at the beginning of the week. You have to “vote for” (aka agree to buy) the actual winner to get the Gold winner edition.